From its start in 1974, with just 286 entrants, to being the fastest marathon course in the world, the BMW Berlin Marathon is steeped in history, tradition and world record breaking runs. In 2019 we will be hosting your trip to Berlin and you can travel with Australia's most knowledgeable marathon team; the facts, the figures, the history, the training, the day. 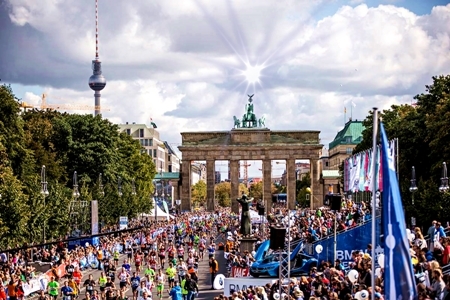 Experience the Berlin Marathon you deserve! The BMW Berlin Marathon has long been renowned for its slick organisation and fast course - which it certainly is at the elite end, with a role of honour the includes the first sub-2.20 by a women, the first sub-2.05 and in 2007 we saw Haile Gebrselassie improve Paul Tergat’s mark with a new world best of 2.04.26......then, just to prove he was by far the best, Haile took the record under 2.04 in 2008. All great until 2011 and, wow, Patrick Makau puts in that 2.03.38. 2013 didn’t disappoint either and Wilson Kipsang ran himself into the (world) record books with a blistering 2:03:23. In 2014 Dennis Kimetto added to the wall of honour by recording the first ever sub-3hr marathon, running 2:02:57. 2018 saw Eliud Kipchoge SMASH the world record, running a blistering 2:01:39 on the fastest course in the world. The BMW Berlin Marathon is just as good for those further down the field, with the route passing through famous and infamous districts on excellent roads and finally passing through the Brandenburg Gate, that symbol of the old divide between east and west to the finish 400m beyond. The city of Berlin is well worth a visit – it is a city of history, culture, art, architecture and fabulous night life. With no shortage of things to see and do – the Brandenburg Gate (you’ll get a close up as you finish the marathon! ), Schloss Charlottenburg, Alexanderplatz, Berlin Cathedral, museums, art galleries, night clubs, restaurants, famous landmarks….. you’ll never be bored in this vibrant, friendly city. Eliud Kipchoge SMASHED the Marathon World Record in 2018 - What Can You Do! At the expo BERLIN VITAL you will receive your starting documents upon presentation of your registration confirmation! The expo BERLIN VITAL highlights the latest lifestyle, fitness, wellness, health, and nutrition trends. The expo will host more than 190 national and international exhibitors and offer everything related to sports performance, functional wear, nutrition, sports medicine, active vacations and much more. More than 90,000 visitors are expected to attend the expo BERLIN VITAL. Take take the U6 subway to Platz de Luftbrucke. All runners will start at 9:30 am from the Schloss Charlottenburg towards the Olympiastadion. After this no mean feat all runners will have a power-breakfast to load up the energy store of their bodies. There are no showers available nor is there any clothes transport/storage facilities. Clothing may be dropped off at the tent allocated for your race number. Clothing bags are provided with your race materials and will contain stickers with you race number on it. A chip hire fee is included in your registration. Failure to return the chip after the event will result in an additional charge of 25 euros. Aid Stations will be on the right hand side, except for those between 5-15km where they will be on both sides. They will be located at (approx.) km 9/15/20/25/30/36 and will have available Personal Refreshments, Water, Tea/Power Bar and Fruit (in that order). In addition there will be extra refreshment points at (approx.) kms 5/12/17.5/22.5/27.5/34.5/38/40 and Powerbar gel-point at 27 (subject to change). Drinking water in cups and water containers for dunking sponges wil be available at these points. Medical assistance is provided in the start/finish area and along the course. The medical network will be everywhere! 3nt itinerary also available, please refer to our e_Brochure! Our 2019 Guaranteed Entry and Accommodation Packages are now available, from $1340pp, twin share.